Kristen Wiig Has Officially Joined ‘Anchorman 2’!!! So far right now, we have no idea what character she will be, but we think it will be a hefty role. We heard this news from Mckay’s twitter account when he announced the good news. Wiig is an amazing talent as she has showed us time and time again from her SNL days to ‘Bridesmaids‘ to her voice as Lola Bunny on Looney Tunes. I cannot wait for this film. 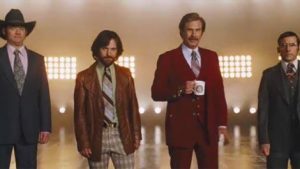 Film Review: ‘Anchorman 2: The Legend Continues’!! Check Out the New Hilarious Trailer for ‘Anchorman 2’!!! Harrison Ford Joins ‘Anchorman 2’!!! Ben & Jerry’s Launches “SCOTCHY SCOTCH SCOTCH” Flavor in Honor of Legendary Anchorman Ron Burgundy !! This entry was posted on Monday, February 4th, 2013 at 11:10 pm	and is filed under Film, News. You can follow any responses to this entry through the RSS 2.0 feed. You can skip to the end and leave a response. Pinging is currently not allowed. « There is Going To Be An Uncle Ruckus Live Action Film!! !